Hill Auditorium was built by noted architectural firm Kahn and Wilby. 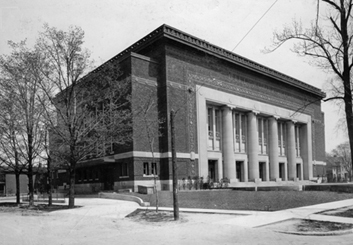 Completed in 1913, the renowned concert hall was inaugurated at the 20th Ann Arbor May Festival, and has continued to be the site of thousands of concerts, featuring everyone from Leonard Bernstein and Miles Davis to Bob Marley and The Velvet Underground. In May, 2002, Hill Auditorium underwent an 18-month, $38.6-million dollar renovation, updating the infrastructure and restoring much of the interior to its original splendor. Exterior renovations included the reworking of brick paving and stone retaining wall areas, restoration of the south entrance plaza, the reworking of the west barrier-free ramp and loading dock, and improvements to landscaping. Interior renovations included the demolition of lower-level spaces to ready the area for future improvements, the creation of additional restrooms, the improvement of barrier-free circulation by providing elevators and an addition with ramps, the replacement of seating to increase patron comfort, introduction of barrier-free seating and stage access, the replacement of theatrical performance and audio-visual systems, and the complete replacement of mechanical and electrical infrastructure systems for heating, ventilation, and air conditioning. Re-opened in January, 2004, Hill Auditorium now seats 3,538 [4100 prior to renovation].